« Nutch – How regex-urlfilter.txt really works!? 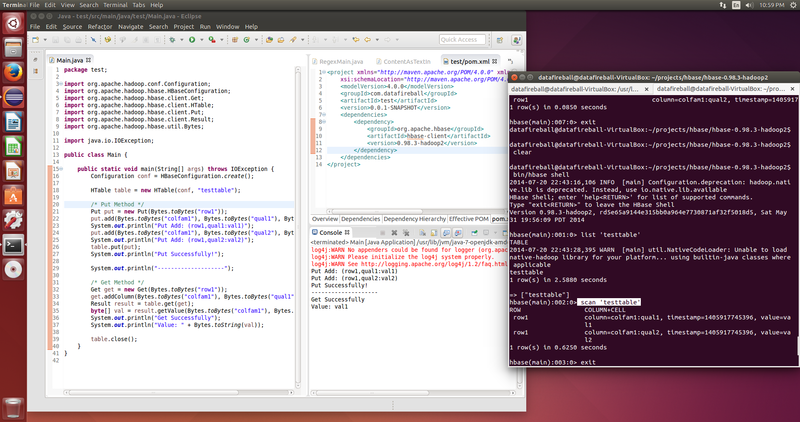 To set up HBase on ubuntu, I would say the hardest part is to set JAVA_HOME. (Dude, there is nothing easier than setting up JAVA_HOME, yes, to make HBase work is that easy). What I did in the end is using openjdk-7 and added this line to my ~/.bashrc file, you can find your java home by tracing down those soft links of `which java` or `which javac.`. Also, what you just did only set up the environment variable for your user account, if you run HBase as root..etc. Make sure JAVA_HOME is set correctly. Also, make sure there is a bin folder within the path and you can see java and javac there. After you start your hbase server, and probably checked it is working properly by running /bin/hbase shell to interactively play with HBase. Then you can start writing your java code to interact with HBase. Here is a screenshot that I took in my virtualbox 🙂 (lovely new development environment). Also, in Lars George’s github, who is the author of the O’Reily book “HBase The Definitive Guide“, there are a whole lot of Java code to help you get started with HBase API.